No thank you 24" x 42" 24" x 48"
It’s all about branding your business with simplicity. When we think of some of the world’s top brands, often we think of simplicity, or the personification of a single idea. These companies have condensed everything around them down to the bare fundamentals—no complexity and no superfluous add-ons, just simplified value. Companies that come to mind are Apple (even the name spells simplicity), Subway, and Google. Facts, figures, and data are all trying to grab attention these days. It’s enough to make your head spin. In order to keep up, people have become accustomed to making fast decisions. Branding your business from the inside out with simple, easy-to-understand branding has a distinct advantage. For this reason, 90 Degree Office Concepts has approached many of its design concepts with simplicity in mind. Designs that are easy to look at and easy to understand result in easy-to-understand brands. Simplicity makes for harmonious brand communication. Our mindset is about helping you create this type of simplified interpretation of your business for customers, vendors, and new hires. Chances are, with a reduction of unnecessary details in your reception area, you will be able to communicate your brand at a glance. "Building great concepts for your brand." The Troy Modern Reception Desk was intended to fit right in with an extremely uncomplicated and contemporary company culture. It is tastefully fashioned to intensify the KNOCKOUT factor in your lobby workspace. 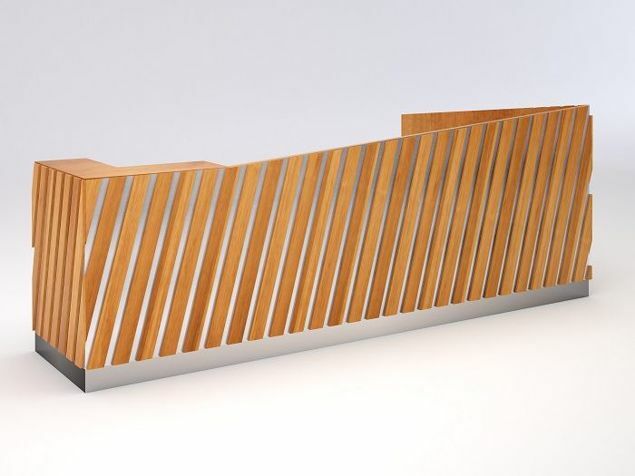 This modern reception desk may seem basic in design, but its simplicity packs a big punch. The inlaid metallic facial element adds an outstanding visual dimension that attracts the eye at first glance. 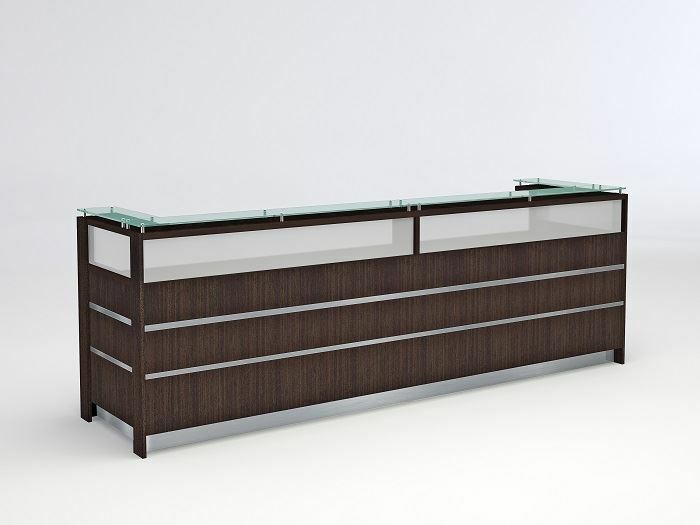 The fact that this modern reception desk is offered in an assortment of colors and materials enables you to design the perfect reception desk to fit your brand, space, and budget. The Troy comes standard as a 72"L desk with a height of 42". The entry-level material for this desk is melamine construction with a brushed aluminum 4" protective base. The interior and exterior face will be equal in color. The work surface is sized at 24"D x 70.5" x 1-1/8", and overlaid with HPL laminate. Also available with a left or right return (optional). Suspended above the frosted acrylic glass window is a transaction top that measures 8"D x 72"L (glass optional). 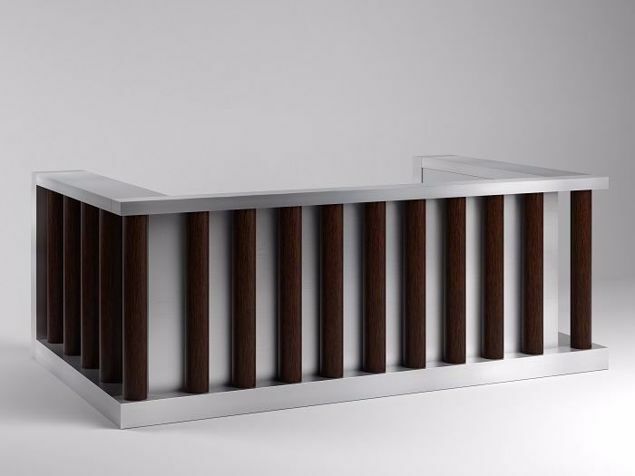 Because all of our reception desks are made from the ground up, you can select from an array of finishes and choose the perfect size for your reception-area fit. 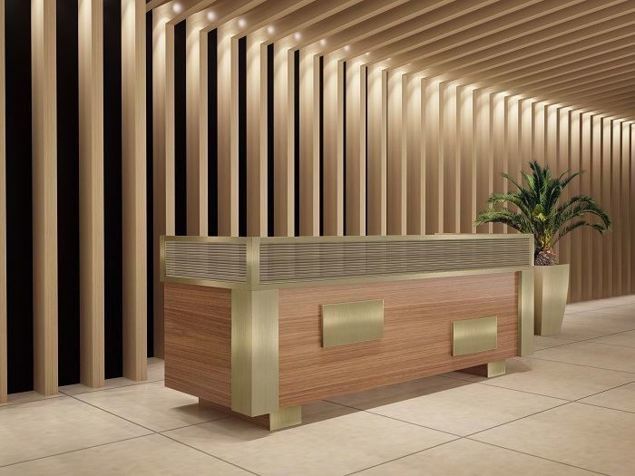 The reception desk shown here is manufactured from high-quality, domestic-grade maple wood veneer and is inlaid with brushed aluminum. This desk is shown at 120"L x 27"D x 42"H, and is finished in espresso. The transaction top is adorned with clear tempered glass suspended by 2" stainless steel standoffs. No problem! We can change the size, material, color, or finish for that special match. Need to find the right reception furniture to match a budget? Let us show you how to do it affordably. It’s simple! Just tell us what you want. Call us: 855-699-0334.